One way to accept donations online is to create a product that offers various amounts for donations as shown here. In Cart66, this is a subscription product set up for monthly billing with product variations that change the price of the product. The base price of the product is $10 and each variation adds to the base price of the product. This is what the product looks like in your Cart66 dashboard. We’ve set the product variations so that the $10 per month variation is the default choice. Each additional variation increases the price of the product. So, for example, since the base price of the product is $10, the $20 per month variation raises the price of the product by an additional $10. 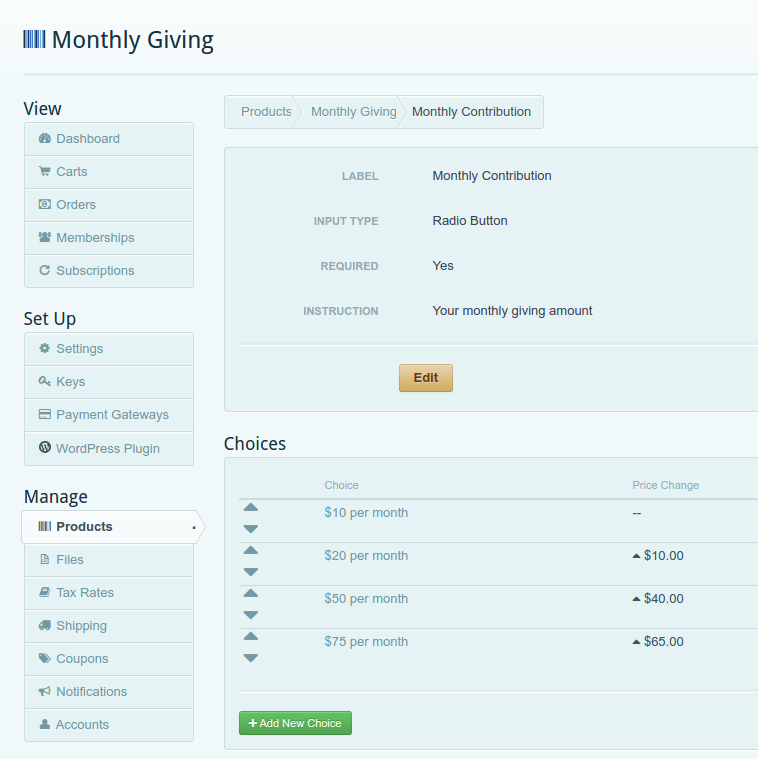 This is how the $20 per month product variations are configured. We have set the label to $20 per month and we increase the price by $10 from the base amount. Another layout you can use are donate now buttons. You can create products in Cart66 and then set the text for the button to be the donation amount. Donate now buttons can look like this. This layout is actually composed of four different products. Each of the buttons represents a product in your Cart66 dashboard. 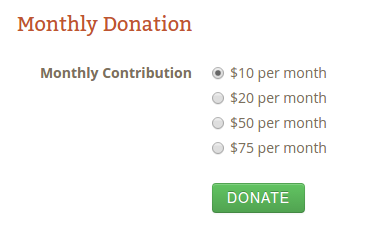 For example, this is the configuration for the $25 donate now button. 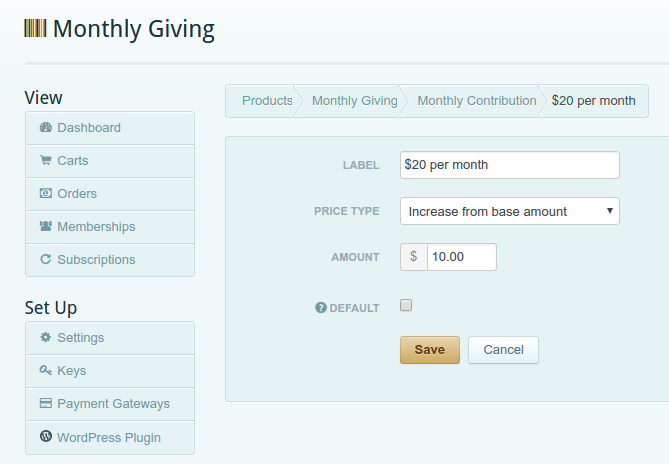 This particular example shows a one-time payment button, but it could easily be changed to a recurring monthly donation button by clicking the is this a subscription button and setting a recurring price rather than a one-time price. Any time a person makes a recurring donation they will have an account on your site where they can go to manage their billing information. For example, if they need to update their credit card or enter a different credit card they will be able to log in and manage their payment details and cancel their future donations if they need to. If you’d like to make it easier for your one-time donors to give again, you can invite them to create an account on your site that will save their billing information. So, if they give a one time donation now, they can come back later to donate again and not have to enter all their billing information again. To enable this feature, log in to your Cart66 dashboard and got to Manage -> Accounts and click either Optional or Required. Optional accounts means that the person is given the choice whether or not they’d like to enter a password during checkout and save their billing information. This is probably the option you’d like to use. Required accounts means that the person must provide a password during checkout. With either Optional or Required accounts, when the person comes back to your site, they can log in with their email address and the password that they set when they created their account. All of the different layouts for showing donation buttons on your site are available both for one-time and recurring donations. The layout has nothing to do with whether or not the subscription is recurring. Your recurring donors will have an account on your site where they can manage the details of their donations like updating their payment method, seeing a history of past donations, and canceling future donations if you they need to. You can optionally set up a similar environment for your one-time donors so their billing information is saved after accepting their first online donation. Then they don’t have to re-enter their billing information for future donations. Cart66 handles all of the billing schedules and the security of the payments so you don’t even need your own SSL certificate on your WordPress site and all payments are safe and PCI compliant.